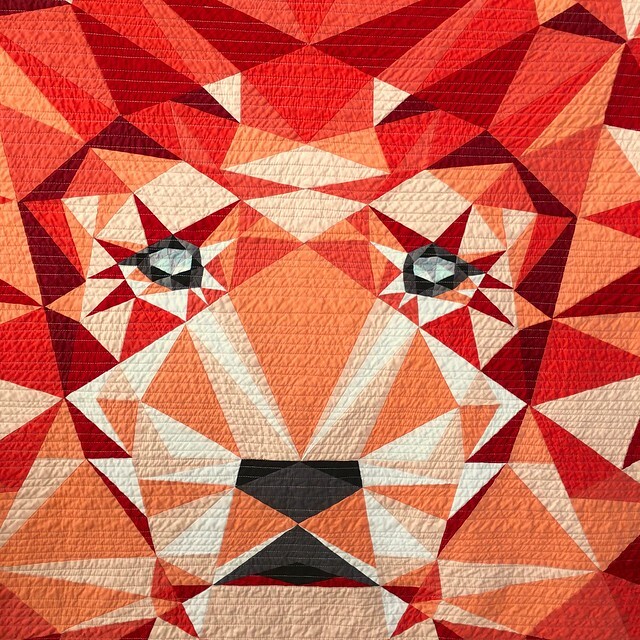 she can quilt: The Lion - Ta Da! Here he is, The Lion. The pattern for this quilt is by Violet Craft and the quilt is about 60" square. 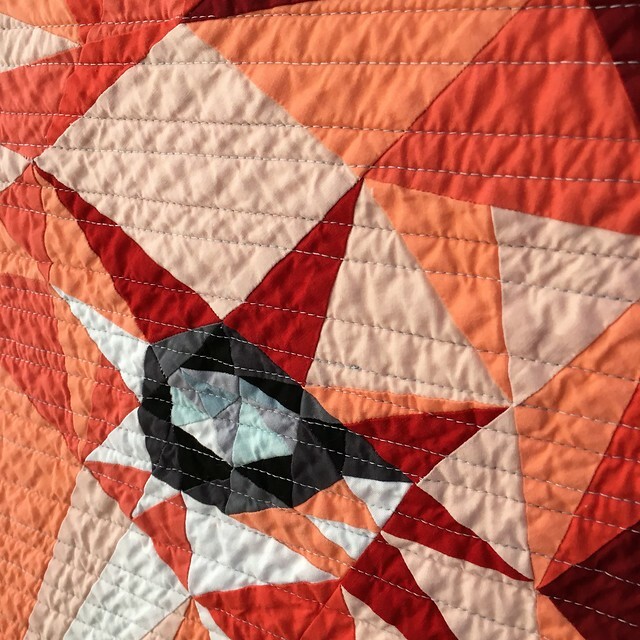 The entire quilt was paper pieced. I quilted him with randomly spaced straightish freehand drawn lines using my longarm machine. The thread is ivory 100% cotton King Tut by Superior Threads. Given that this quilt was made for my youngest to take off to University and thus I wanted it to have some softness, I quilted the lines 1.5 " - 1/4" apart, just eyeballing it. I draw the lines freehand, I don't use channel locks. The irregular spacing and the wobbles give that industrial modern look that I love. 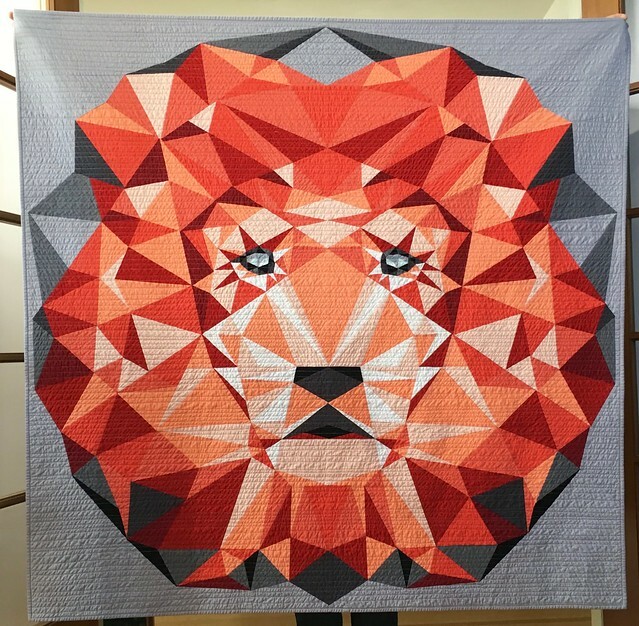 The wash and dry after I was done gave the whole quilt a rugged look, perfect for a lion. By the way, there is a mistake in this quilt, but I did not bother to fix it. I kind of like the fact that he is not perfect. The eyes in the pattern are very effective, here is a close look. Working on this pattern was interesting. There are a lot of paper pieced pieces to make up a 60" square and I sure got tired of just following instructions on the fabric to use and stitching along the lines. The pattern is lovely, with graphics on each section so you easily know what fabric to use, but it takes a lot of time to make it. I ended up working on the pattern over several months, and used it when I wanted to sew but was too tired for decisions. So it was a perfect project to have on the go. And in the end, I made this fantastic quilt. So now I am trying to decide which of Violet's patterns I will start next, because I miss the handy, low stress but fantastic pattern project for those too tried days. The back is simple. The one side is a Paris architectural print and the other is a Zen Chic black on black print. Both go well with the grey binding, intended to just blend into the front. As this is a dorm quilt, I machine stitched the binding on. Here is a photo of the quilt before I put it into the washing machine. Lovely but oh so flat and boring. Also, I fully expect that it will need several washes as it is living in a young man's university dorm room now. 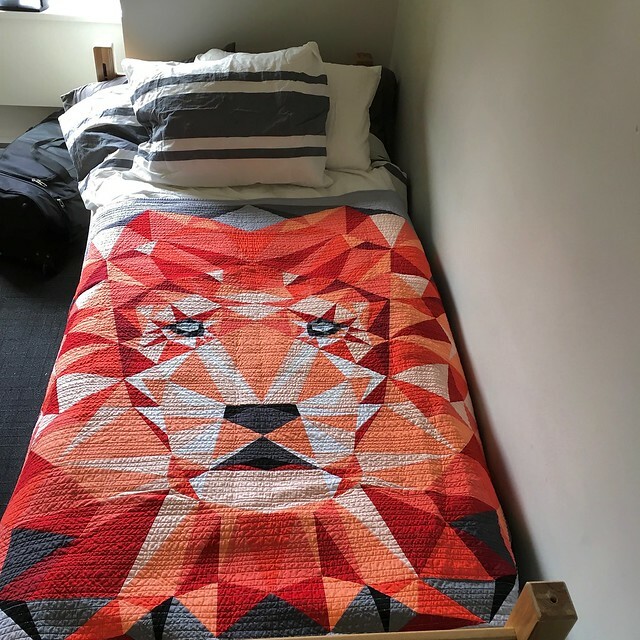 And the Lion did make it to the dorm and the bed. I have since seen photos and he is still there. 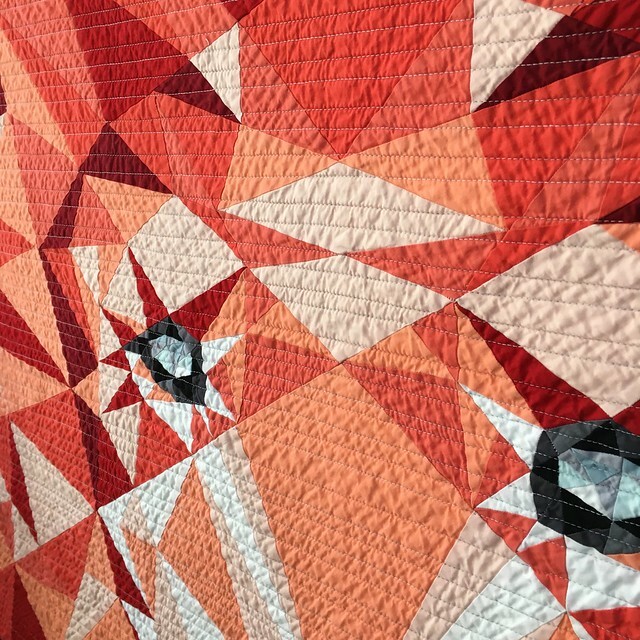 This quilt was also on my Q3 Finish A Long list, which is here, so I am going to share him in the Q3 link up before it closes - it is saying there are just over 9 hours to go now. If you have any other finishes, don't forget to link them up and if you are looking for some inspiration, the finishes that have been linked up are lovely. WOW!! Your lion is magnificient! Paperpieced or not, you did an awesome job on it! I love this crinkly lion!!! Congratulations on your finish, and thank you, on behalf of the 2016 global FAL hosts, for taking part! That is fantastic. Beautiful job. oh yeah. This one turned out SO good! You did such an amazing job with the shades of colours. Beautiful!! It looks great on the bed! Oh my....awesome! I've enjoyed watching your journey to this finish. I've to make one of her large patterns, but I don't enjoy paper piecing enough to tackle one. Great finish! I love this lion. So striking and it looks like it certainly stands out in that dorm room. I love your choice of quilting on it too. I would think he's the envy of the dorm! Fantastic finish! This is stunning Leanne! The quilting is so lovely! It looks fantastic!! I have her elephant pattern, but have yet to get serious about starting it. Her patterns are so striking. Love the Lion!!! I have seen this pattern posted by Violet. Loved it from the beginning. It is really neat to see it all made up as a quilt and not just a pattern. Love the backing and good choice in quilting! I am quite impressed with your son's quilt, made with love, by his mother. I loved your typifying it as a lovely project on tired days, and how bit by bit, it came into view. It's wonderful, Leanne, and I applaud your skill and perseverance! What a gorgeous quilt you made your son! Lucky! Such a fabulous quilt Leanne, a great pattern too. This is glorious - Great job! I wouldn't fret about the error, it took me three times of hunting before I spotted it. I wouldn't have taken it out either. I so prefer paper piecing for all these triangles. It's a stunning quilt and what a lucky son. 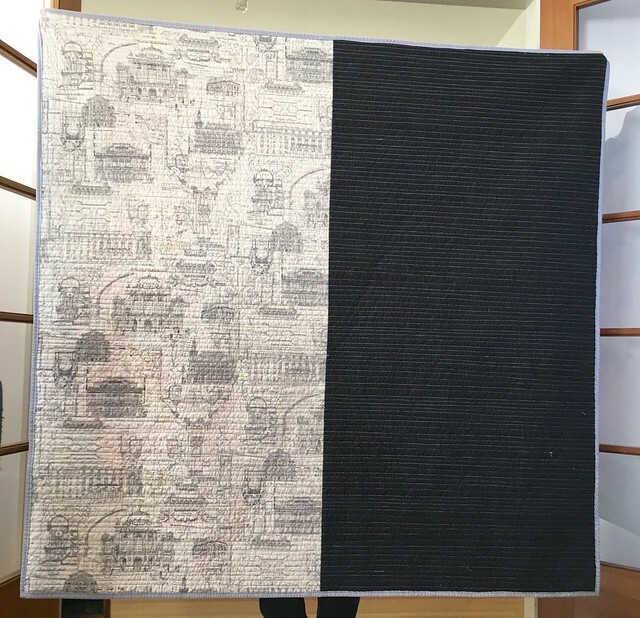 I made (http://cooksewcreative.blogspot.com/2015/10/black-and-white-quilt.html#links quilt) for my son last year. He is a freshman now and asked me if he could use the quilt as a rug. I did not give just a one word response. It's gorgeous! I have a longarm question, are you glad you bought it? I'm contemplating one and wonder if I could get enough use out of it? It is a looooovely quilt! Gorgeous - even if that is the most used word in this comment section :) I admire the quilt and the pattern. To daunting so far to start on it but amazing to see the result. Beautiful quilt. So majestic. LOL. I will run out of patience if I were to endeavour this pattern. Your lion is absolutely stunning!!!! Amazing! 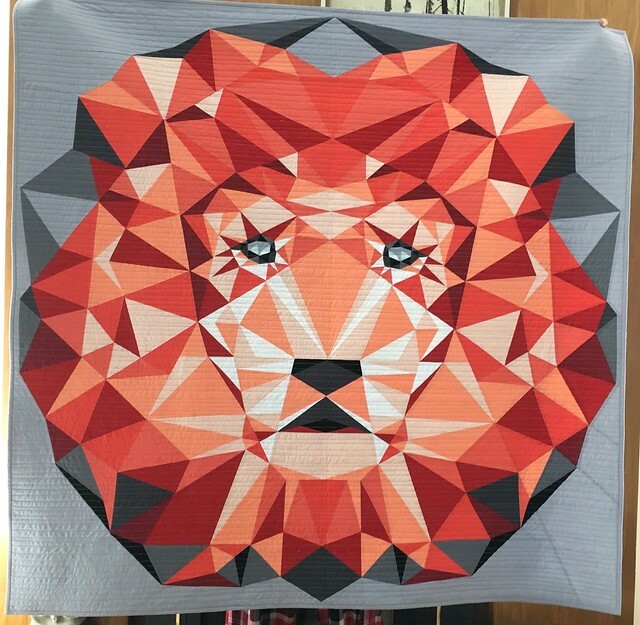 I bought this pattern a while ago, to make for my grandson who is a Leo! Yours is spectacular, and yep, I prefer the crinkly look of it washed, but the best is seeing it on his dorm bed! That must make you as his mum feel pretty happy. Wow I just love this!! The pattern, the colours and the quilting are just wonderful. It made me laugh that this became you go to project for 'low stress, too tired days' - it would certainly be high stress and full of energy days for me! !